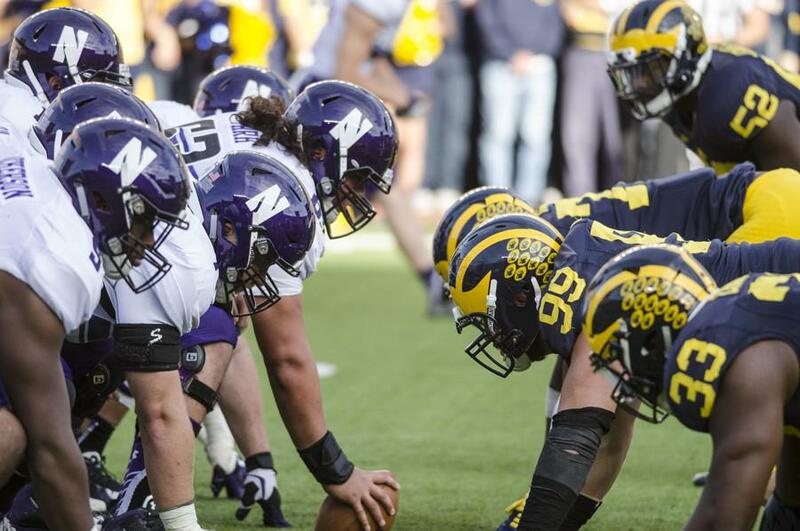 Northwestern’s offensive line readies for a snap against Michigan.The unit will have its hands full against a talented Penn State defense. Pat Fitzgerald regularly praises the opposing team’s players, but on Monday, he took his praise of junior quarterback Christian Hackenberg and Penn State’s dynamic defensive line to the next level. This was Pat Fitzgerald’s superlative regarding Hackenberg during his weekly press conference. Although Fitzgerald’s praise of Penn State and Hackenberg in particular was extreme, he wasn’t far off in terms of projecting the challenge it presents to the Wildcats. Hackenberg possesses undeniable physical tools and arm talent, but his production hasn’t always reflected that. In 2014, Hackenberg threw for 12 touchdowns and 15 interceptions, completing passes at a 55.8 percent clip. Many expected him to grow following a stellar freshman year, but his touchdown-to-interception ratio declined from 2-to-1 to 4-to-5. The obvious blame goes to his offensive line, which ranked 119th in the FBS by allowing 44 sacks in 2014. But the stats show the offensive line isn’t any better this year. In fact, the opponent-adjusted sack rate of the offensive line has actually fallen from 80.2 — 101st out of 128 FBS teams — to an even more dismal 59.9, ranking 124th. Despite this, Hackenberg has increased his level play of this season. Since a subpar opening game against Temple in which he was sacked 10 times, Hackenberg has thrown for 13 touchdowns with just one interception. The offensive line has still been subpar throughout that stretch, but the addition of freshman running back Saquon Barkley injected a dose of new life into the Nittany Lion offense. After carrying the ball just one time Week One against Temple, Barkley has rushed for 715 yards and five touchdowns, averaging more than six yards a carry. Barkley has taken pressure off Hackenberg and limited the number of obvious passing downs Hackenberg has to face. That was Fitzgerald’s reaction to being asked about Penn State’s star-studded defensive line. Seniors Anthony Zettel and Austin Johnson anchor the inside of the 4-3 front, joined by fifth-year senior defensive end and FBS sack leader Carl Nassib. Zettel was a breakout performer last season for the Nittany Lions, wreaking havoc on the inside after moving from defensive end to defensive tackle. He tallied eight sacks and 17 total tackles for loss, putting himself on the national scene and generating buzz about his NFL draft prospects. Meanwhile, Nassib has been an absolute revelation for Penn State, leading the nation in sacks. Nassib, the brother of NFL quarterback Ryan Nassib, has built himself up from a (relatively) scrawny 6-foot-6, 218-pound walk-on to a 6-foot-7, 275-pound NFL-level talent. Nassib presents an interesting combination of size and speed as an edge rusher, showing great hip bend and leverage for a player of his size. In pass rushing situations, he regularly explodes off the line and gets under the tackle, creating problems for the opposing quarterback. Adding to the task of blocking Penn State’s front is its depth, which keeps the top guys fresh throughout the game. Penn State presents challenges due to Hackenberg’s unique abilities, but ironically, the Cats need to focus first on slowing down the run game. Because of the porous Nittany Lion offensive line, shutting down the run game and making the Penn State offense one dimensional is the best chance of repeating last year’s performance, when the Cats rolled to a 29-6 win in State College, Pennsylvania. Even with Hackenberg’s sacks excluded, the Nittany Lions rushed for just 45 yards. As a result, Hackenberg faced pressure all afternoon to the tune of four sacks and an interception, limiting his ability to showcase his talents throwing the football. The second key will be to take away the deep ball. Fitzgerald mentioned Monday that he expects to see six to 10 shots from Hackenberg, who has a very capable deep arm. The return of junior cornerback Matthew Harris should help the Cats in this regard. As for slowing down the Penn State defensive line, the hope should be to exploit their aggressive play and attack them with quick-hitting throws. Although extremely talented and quick off the line, Zettel and Nassib tend to over-pursue, which could bode well for the Wildcat option and screen game. Thorson, who showed a greater willingness to run against Nebraska, needs to have a similar game against Penn State for NU to move the ball consistently. Penn State has talent concentrated in specific areas, so it makes sense for the Cats to take a page out of the Belichick-ian guide to football and take away the opposing team’s strengths. It’s easier said than done, but it is what the Cats will have to do to come away with a victory on Saturday.